We are not yet done, yet Peer Query 3 may already be the most powerful app ever built on the Steem blockchain! If you have been waiting to get on Peer Query, this might be just the right time. We now have a virtual office for the Peer Query team. This will make it easy for the team to manage the site, team, curation, and sponsors. The office space can be accessed only the users on the team, however, as a developer you can explore it when you run a local copy of the Peer Query source code. The office design is taken from Curator's virtual office and is on the route: www.peerquery.com/office. As part of the new virtual office, we also now have curation in-built into Peer Query. This was the initial design, but we previously split out Curator into the standalone system it currently is. However moving forward, we have decided to run all of Peer Query's resources from sub-folder routes(peerquery.com/this) not from sub-domain routes(this.peerquery.com). Hence we now have our curation system inbuilt into peer Query and would no longer run it from curator.peerquery.com or curation.peerquery.com. 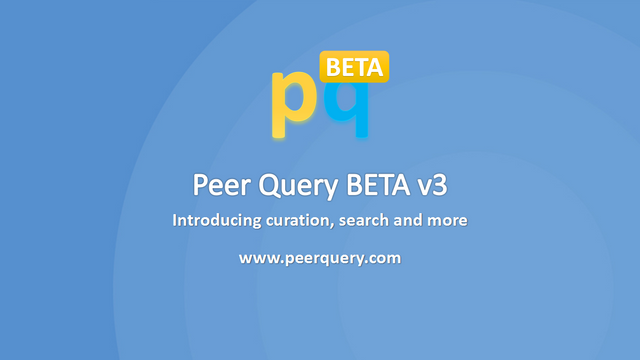 The public portal for our curation service is now: www.peerquery.com/curation. We have a working bot fully set up too, one which votes on curation with the @peerquery (please support us with SP delegations) account. We now have a powerful search function on Peer Query. You can access it from the top navbar or from the search page. This new and powerful search engine is able to search reports, queries, and projects. It supports basic pagination for getting results beyond the first search results. Newly added pages include Support, Statistics, Team, About, Open source, Curation, Blog, Partners. Styling on the post-reading has been improved to make it easier to read posts without stressing your eyes. Font size, line height, character spacing and other aspects of topology have been improved. These categorizations would help us better understand the needs of projects as well as help us design tailored solutions for projects. They will also be used for sort projects, as a form of taxonomy. The project creation portal has been greatly simplified, to make the new project listing process very easy and fast. We have reduced the number of fields shown and only show those required. 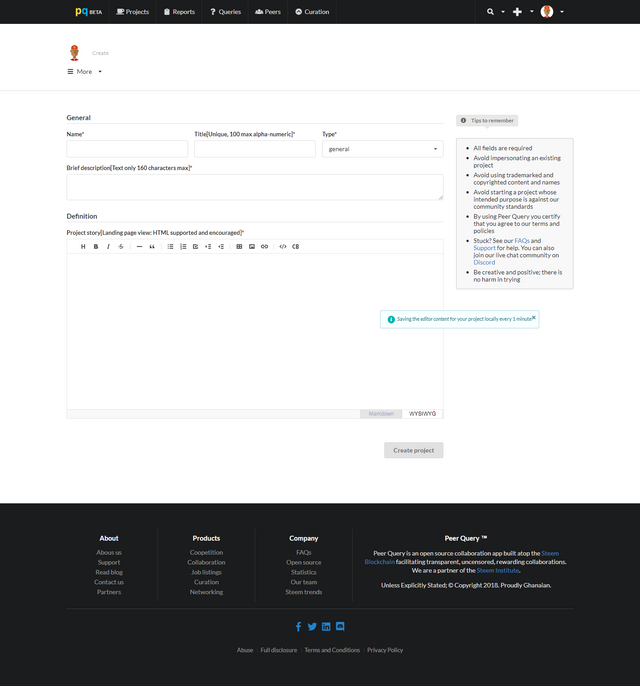 After creating a project you can manage it and configure it with on its settings and management pages. We have linked tour separate sections into two different sections, making the sidebar less crowded, cleaner and more resourceful. Our attempt to use a semantic address scheme for content has introduced a few challenges for post URL schemes. The conventional address schemed used by most Steem apps is: /@username/permlink and /category/@username/permlink. We use the format: /permalink, built using: /[username]-[title]-[unique random alpha-numeric]. This has worked well in some cases, except when the author's username contained the characters - or .. This meant username like @utopian-io or @steempedia.com would not be able to either post or have their posts read. This issue has been addressed with a more advanced parser and scheme, so the number of hyphens and dots contained in a username would not disrupt its URL generation scheme. We will write more on the solution we used new scheme soon. **There have been so many new improvements, you would have to explore the site to discover them for yourself. Peer Query is a peer-to-peer collaborations site built atop the Steem Blockchain. It is a hub to list your project, create queries(such as jobs or gigs) and publish project progress reports. You users can request invites to project memberships, and each project can have a team. You can publish personal blog posts like on Steem, or you can publish reports on projects. As an enthusiast, you can join any project you like or remain a blogger or contributor. You can also join our curation team. As an investor, you can delegate Steem power to our curation team project and earn returns from our author reward split. You can browse the queries section to find jobs or gigs, and you can create them. 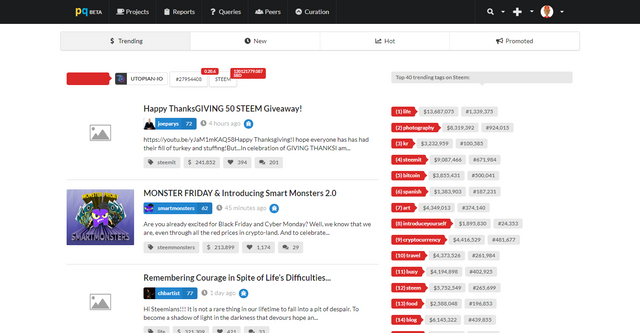 You can also discover, read and interact ( resteem, vote, follow author and comment ) on all the trending contents on Steem right on Peer Query without leaving to Steemit.com or Busy.org. There is so much you can do on Peer Query, you should try it for yourself. Why should you join Peer Query? Build your dream: Everyone has ambition. Peer Query is built to allow you to build your dream together with like-minded peers. Get rewarded in Steem: We have a curation system in place and ready for production so your efforts will not go in vain. Build on Steem! 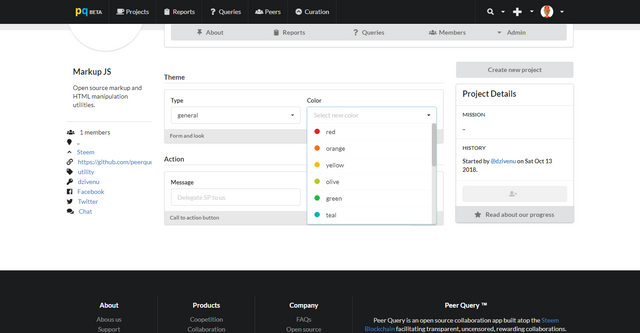 : Peer Query was built for Steemians and their projects. All reports published through Peer Query are simple Steem posts, like those published on Steemit or Busy. This means you engage the Steem community, their participation, and support. Peer Query is free! : We intend to split curation rewards for post author rewards to support our work and rewards our curation Steem Power delegators like on other apps, but the amount would be very minimal. Project control: As a project owner, you can transfer your project, export its data as JSON(XML coming soon) or delete it. We are open source and accountable: since inception, Peer Query has been an open source and has been supported widely by @Utopian-io. Peer Query is safe! : we are powered by Steem Connect, so you keep your keys to yourself! We only ask for posting, voting, and custom_json auths. Nothing to do with funds or higher auths is required. You can always revoke our auth from Steem Connect. Peer Query is evolving: More updates are on the way, with improvements, new features including notifications, messaging, account creation(Steem), escrow creation and many many more. 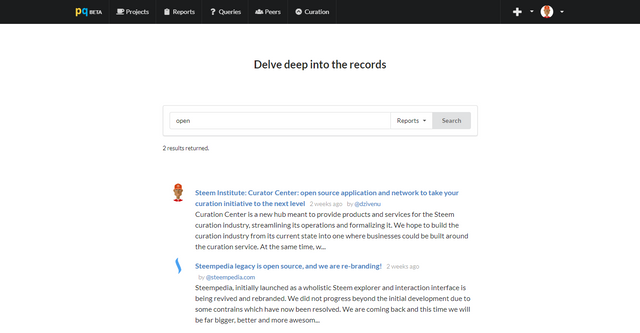 The Peer Query curation service is used to support the work of project authors. Project's team publishes reports on the progress of their project, news and even conventional posts by users. Our curation team reviews them and selects the most intriguing for curation votes by our @peerquery account. Our curators and team also do receive votes from our account for their work. If you want to support the work of our community's project teams as well as our work, kindly consider delegating Steem power to support our @curation services. We have a package for Steem power investors too. Contact us in our Discord channel: https://discord.gg/rz9GwAa. If you are also interested in curating quality project reports as well as exciting posts by the community members, consider joining our curation team: https://discord.gg/rz9GwAa. Curators receive daily upvotes on their posts. Thank you for your amazing contribution. Your post is rather informative, well-illustrated with quality screenshots, and very easy to read and understand. Well done! I enjoyed reading your post and I certainly learned a lot in the process. However, since this is a blog post, I just wish you'd gone into more detail regarding your personal views and experience of working on this project. This is a well-written blog post that contains much information; a bit more personal feedback would make this a stellar blog post. In conclusion, I appreciate the time and effort you put into this post and look forward to seeing more awesome content from you in the future. I upvoted your contribution because to my mind your post is at least 12 SBD worth and should receive 188 votes. It's now up to the lovely Steemit community to make this come true.